Nicola Sturgeon was proclaimed Queen in the North in extraordinary scenes at the Scottish Parliament yesterday. Following a blonde-haired mad person’s decision to blow up the Southron government and economy for no real reason, the North are preparing to raise their banners in defiance. Sturgeon closed her opening remarks by saying: “They want me go down there, swear fealty and kiss the mad blonde one’s arse? Just let them do all the EU negotiations for us? “These Southron cunts want the North on its knees. Lady Dugdale of House Labour gave her qualified support, but reserved her fury for Lady Davidson of House Tory, who she said had betrayed the North during the notorious Blue Wedding, which saw legions of House Labour supporters massacred by the Tories at the ballot box. Lady Dugdale said House Tory had abandoned her kind in favour of “grapewater-sucking Southern cunts”. But Lord Willie Rennie of House Lib Dems, a fierce and fun warrior from Fife, rose to pledge Sturgeon all 5 of his fighting men. Raising a sword made out of balloons he got from Coco’s, Lord Rennie then pointed it across the chamber at Lady Sturgeon. “There sits the only Queen I’ll bend the knee to. THE QUEEN IN THE NORTH!” cried Rennie. Ser Harvie got to his feet, brandishing a bio-degradable shovel. Lady Dugdale was next to rise. “Do I have your word that you will not betray our cause and the integrity of these four kingdoms, now and always?” she asked Sturgeon. As the chamber broke out into an unreasonably long chant of “THE QUEEN IN THE NORTH”, Lord Macintosh of House Speaker gave up trying to restore order and snuck away for a few yards of ale. Former Warden of the North Lord Salmond had previously tried to declare himself King in the North, but had been smashed by the infamous hammer of the evil one, Ser Gordon Brown. 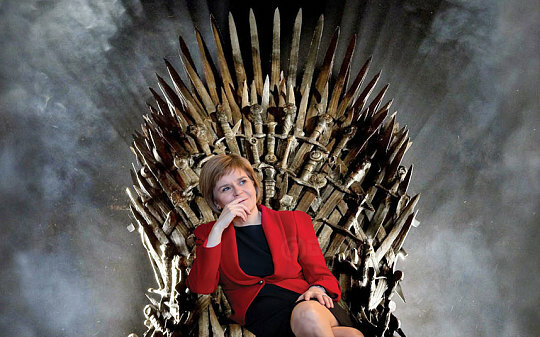 No it’s not, the original Throne was reclaimed by some of Queen Nicola’s followers and returned to it’s true home. The one in King’s Landing is a copy, one of many made to protect the one true Throne. And the new leader of the south might not be Deanery but she’s certainly a dragon.